It’s happening. I’m talking about the white-washing of Nelson Mandela’s legacy. Journalist Bob Herbert spoke to this phenomenon in a recent article on Mandela. He cautioned us to not let the mainstream turn Mandela “into a lovable, platitudinous cardboard character whose commitment to peace and willingness to embrace enemies could make everybody feel good” as they have attempted to do with Dr. Martin Luther King. The white mainstream media and other institutions would have us believe that Dr. King was a mere dreamer. In addition to King’s resistance to racism and economic oppression, he publicly stated his opposition to many U.S. policies like the Vietnam War (against the advice of his confidantes), the death penalty, poverty and other economic inequities. Yet every January and April, we get bombarded with selected excerpts from his famous “I Have a Dream” speech that downplay King’s understanding about capitalism and its impact on the masses of Americans, especially black folks. Read more. It’s been a while since education dominated the local news headlines. All of it is not necessarily good news, but what’s good is that people are fully engaged in discussing the complex issues of public education. Ferguson-Florissant Superintendent Art McCoy Jr. has been benched. The student transfer fiasco is out of control. State education commissioner Chris Nicastro’s resignation has been demanded. It is important that concerned citizens stay focused until these major issues get resolved. A few weeks ago Normandy Superintendent Tyrone McNichols made his presentation to the Missouri Department of Elementary and Secondary Education (DESE) at a public forum. In the midst of trying to turn around a failing school district, Normandy is on the brink of financial disaster as a result of the ill-conceived payment plan for student transfers to accredited districts. I always chuckle with I see this photo of me and Nelson Mandela. 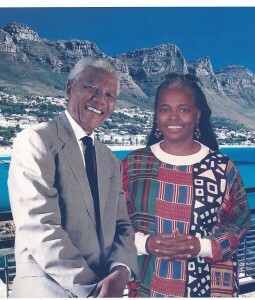 The photo was taken as a souvenir for tourists when they get off the cable car at Table Mountain in Cape Town, South Africa. The photo is fake but my deep admiration for Mandela is real. The passing of this great leader pushed me to visit my photo album of my 2001 South Africa visit and the memories always come rushing back–the visit to Mandela’s cell at Robbin Island, the warmth of the South African people, talking with children on the schoolyard, the political discussions in the coffee houses, the hustle of Johannesburg, the dance of the Zula warriors…I reflected on all the work I was a part of during the anti-apartheid movement and felt like a citizen in this new country. I had done my small part of bring the racist regime down but as my eyes confirmed, the dreams of the black masses remain unfulfilled. Amandla awetu! The power shall be ours!